With high carbon stainless steel blades and polycarbonate handles, the SPATHA offers few features which compete with even basic American folding clip knives. With the SPATHA you do get a carabiner hole, making the knife easy to attach to climbing gear, and the one-handed opening system is certainly unusual. From either side, it's possible to rotate the blade out of the handle with the large cogged plastic wheel that encloses the bearing. Light weight is also on the SPATHA's side, since the small 3.9-inch version with serrated blade weighs only 1.8 ounces. Even the larger 4.75-inch, plain-edged SPATHA weighs only 2.5 ounces. Unfortunately, the SPATHA knives are also lightly built and lack even the simplest safety features like liner lock or textured grips. It's hard to understand how a company which makes such fine climbing axes could fall so short on knives. Climbers still may be interested in the SPATHA simply because of the brand, but if you buy one for a mountaineering friend don't be surprised if it gets left behind. 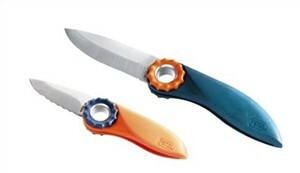 If you need a lightweight climbing knife good enough to depend on, see the Buck Summit. Designed by Peter Whittaker, the Buck Summit provides the minimum that a climber needs plus a corkscrew. The Buck Summit weighs an ounce more, but it's an ounce you really need.